Tau Station is a text-based online Massive Multiplayer Role-Playing Game (MMORPG) set in the future in space, in a post-catastrophic environment. I (moritz) was a tester in the closed alpha testing phase, and want to document the things I wished I knew before I started. This document also contains corrections and contributions from Perleone, Shadow, Dotsent, Xierumeng and Ovid. Note that Tau Station is under active development. Hence, parts of this document might become outdated when the game changes. Despite the alpha status, the development team has promised that there will be no resets/wipes when it leaves alpha or beta stage. Tau Station is policed very well and you are safe there. Once you visit other stations, you will eventually be attacked by raving lunatics, single-minded sociopaths, coldhearted killers and bloodthirsty psychopaths. They will bring you to within an inch of your life and send you to sick bay for about 16 segments. Unless you’re on Bordeaux or Caen, where you will die. And, adding insult to injury, they will also loot your wallet and get away with a percentage of the money you’re carrying around. What can you do to protect yourself? These aggressors are players of advanced levels with high physical stats and considerable weapons and armor. So eventually you will lose the fight. But there are things you can do to minimize your risk and exposure. Always bring your money to the bank, deposits are free everywhere, and withdrawals at your local branch as well. Never keep more than 100 credits on yourself. Always stay in a hotel room. That’s the only place you’re safe, and your stats will regenerate faster there. Plan your revenge, if you’re so inclined. Get together with other victims, get organized and gang up on the perpetrator. There are credits and bonds. Credits is everyday money that you can earn pretty easily. With credits, you can pay for things such as hotel rooms, public shuttles for inter-station travel, University courses, and weapons and armor. This list is roughly sorted by utility. VIP packs and accelerated University courses are a pretty good way to spend bonds, while I’d only use bonds for fast shuttle travel if there was a very good reason. You can have credits in your wallet and in your bank account. From your wallet, you pay most of your everyday purchases like shuttle fees, item repairs, hotel rooms etc, with the exception of things you buy from the Public Market (which directly withdraws from your bank account). Credits from your wallet can be looted if somebody wins a fight against you, and are lost if your character dies. Bonds are always kept in the bank, but you can pay them directly without visiting the bank. At your home branch, withdrawing credits is free. At other branches, the withdrawal fee is 3%, or 1% if you are VIP. You can transfer your home branch to any Consortium station, and then benefit from free withdrawal at that branch. The account transfer fee only depends on the target station level, not on the account balance. For big purchases like higher-level University courses or private ships, transferring the bank and then withdrawing for free can be cheaper than paying the withdrawal fee. Deposits are free at any bank. There is no way to convert credits to bonds. The bank offers you to convert bonds to credits at a 1:5 conversion rate, but that is a pretty terrible exchange. You get a better rate if you go to the vendors at the Market, and buy a 3-day VIP pack for 290 bonds (which you can do once every 7 days). You can sell this at the Public Market for somewhere between 30,000 and 50,000 credits (of which you need to pay 10% as market fee). Before you do that, ask in the chat if anybody is willing to buy it, and at what price point. That way, you get a conversion rate of 1 bond to 90..150 credits. If you don’t have enough money to afford the seller’s fee on the market, you can try to find a potential buyer for the VIP pack in the chat, and maybe they’ll help you. If you don’t even have a 1/100th of the agreed-upon price, you might need to conduct this process twice. Of course, this process requires that the designated buyer trusts you not to run away with the money before the final VIP pack sale. Note that you use the same process to buy VIP packs for real-world money, and turn them into credits that way. Another way to convert bonds to credits is to pay 20 bonds bribe for an extra ration (which you can do once every 24 hours), and sell that ration on the Public Market. Tier 2 rations tend to sell for somewhere between 1800 and 2500 credits, giving you a similar conversion ratio to the VIP pack trading. Whenever you try something, and the success is not a foregone conclusion, you use up some of your Focus, and one of the five stats: Strength, Agility, Stamina, Intelligence, Social. Regeneration might be slightly faster if you stay longer in your hotel room. Regeneration is slower if you are confined to the Sick Bay or the Brig. Consuming stims and drinking at the bar can also instantaneously increase a stat a bit, though at the price of raised toxin levels (for stims), or at consuming Focus and risk of injury (drinks at the bar). Both are usually not worth the risks and downsides. In addition, there are multi stims that boost several stats at once. Those go up to Tier 5 and can only be acquired from Enter the Sewers campaigns. In order to avoid the second outcome, it’s always wise to use the Toxicity calculation formula before taking any stim. This means that if you take a stim that’s of the same tier as you, you’ll gain the toxicity equal to stim’s declared Toxicity percentage. However, if you are taking a stim one tier lower than yourself, you’ll gain double of the stim’s declared toxicity, if you are two tiers higher than the stim, you get triple of the stim’s declared toxicity etc. Exception: if you take a stim of the higher tier than yourself, you immediately gain 100% Toxicity and land in Sick Bay. Before the last significant development update of stims functionality, which significantly improved their usefulness and decreased toxicity, there were risky cases when high-level players would immediately land in the Sick Bay by taking just one stim. This is not possible anymore with the current levelcap (25), but mind the future changes! player_stims_skill_level - a value that depends on player’s finished University courses, specifically Medical Stims, Medical Stims Specialization and Medical Stims Mastery. At the moment of writing this there were no active players who have completed Mastery course, so the formula was only tested for the values 0, 1 and 2. The resulting percentage is rounded for display, so it might actually show 1% larger gain than calculated. The stims are mostly useful if they match the player’s tier. However, after the last update on stims functionality even lower-level stims can moderately help even higher-level players in combat or outside it. Most stations (all except the jump gates) feature a Gym, where you can invest focus and current stat values to train the physical stats (strength, agility, stamina). You can train intelligence in a similar fashion in a hotel room of an Inn, or at a University (scroll to the very bottom of the page). Most stations (all except the jump gates) have an Inn, and four stations have a University (Tau, Nouveau Limoges, Moissan, Spirit of Botswana). You can also train intelligence while traveling with public shuttles or in your private ship. The social stat can be trained at the Lounge that belongs to an inn. The efficiency of training of any of these stats depends on the station. In general, higher-level stations yield better training benefits. For example on Tau Station (level 1), you get about a 0.004 stats increase for every 10% of focus that you invest. On Yards of Gadani (level 10), the stat increase is around 0.019. The training efficiency is roughly 0.3 + 0.15 * StationLevel, in 1/1000 points stat gain per Percent focus invested. 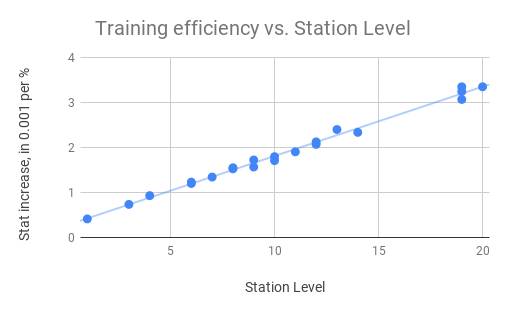 The training efficiency on shuttle/ship rides is the same as training on the destination station. Training also depends on the character’s genotype, because genotypes have pre-dispositions for certain traits. Belters, for instance, find it easier to train Agility (where they get a 5% bonus) than Strength. All genotypes except Baseline have one stat with +5% bonus, one +2% bonus and a -5% handicap. Training can lead to injury (and thus unconsciousness or time in the Sick Bay) if your stats are too low. Each gym has a minimal sum of combined physical stats that you need to avoid injury, starting with 30 at Tau Station and going up to 45 at Amazon and Maid of Orléans. Slightly higher limits (though not explicitly denoted) apply to training of the social and the intelligence stat. If you are repeatedly injured or becoming unconscious or detained from training, go back to a lower-level station, increase the relevant stat there, and then try again at the higher-level station. Stats can also randomly increase as a bonus of successfully completed discreet work. Finally, the primary and secondary stat of your career improve once per day, taking place at the same time as your salary payment. High physical stats lets you carry more mass before encumbrance kicks in. High physical stats are harder to drain during combat, so they act as protection against attacks. You can survive without explicit use of rations. But, each time you consume a ration, it immediately fills up all of your stats and your Focus. If you consume a ration of a tier one lower than your character’s, the immediate regeneration is incomplete. A ration two tiers below your current tier gives hardly any immediate regeneration. Rations which are three or more tiers below your current tier are absolutely useless for regeneration. You can either sell them on the public market or gift them to other players. Rations also give you the “well fed” status for 32 segments (roughly 8 hours), which increases stats and Focus regeneration. For rations of a lower tier, the “well fed” status is shorter (10 segments for a tier difference of two). “Well fed” stacks up if you consume multiple rations. You are automatically assigned one ration per day, which you can fetch at any station’s Government Center, except Caen Stronghold. You can spend bonds as bribes for more rations at each station’s Government Center, though the price doubles each time you do it in one day, and drops back to the original price (20 bonds) 92 segments (almost one day) after your first bribe. You can buy rations from NPC vendors on Caen Stronghold (Barnard’s Star), for 3160.80 credits per tier. Sometimes they are awarded as the random reward for doing discreet work. As in every RPG, there are several different things you can do, with different resource requirements and payoffs. Missions are fun! You can find a mission by clicking on the “Find a mission” link in the “Employment” box. A mission opportunity is marked by the orange action flag, either in an area or next to a person. During missions, you typically invest focus and some stats. After you have finished the missions on Tau Station, you must travel to other stations to find missions, and those missions might again prompt you to travel to other stations, which costs you credits (and there are missions that require at least three interstellar travels). Also, sometimes bribing somebody with your own credits is the easiest way to convince an NPC to collaborate. There are situations where you seem to be at a dead end, which can be fixed by having enough credits in your wallet. Missions are the primary source of experience, and also give you a small financial reward. Some missions reward you with items, such as weapons or armor. The Education mission on Estación de Amazon, Barnard’s Star can give you a sizable boost to your Stamina. But most importantly, missions are interactive short stories that are enjoyable to read and experience. Some missions also build on other missions, and you can only engage in the later missions if you completed the previous missions successfully. There is also a mission (In the Crossfire on Hopkins’ Legacy, Barnard’s Star) that depends on having completed a side job (Wall Maintenance on the same station). I advise to play all missions available to you. All stations have a Ruins area with the Wrecks sub-area, where you can scavenge for discarded stuff. Each search costs 10% stamina, and if you find something, also 10% of Focus. Each successful find also adds to your experience. What you can actually find in the Wrecks is partially dependent on the station you are searching on. For example the weapons and armor you can find tend to be similar to those you can obtain through Look for Trouble, and the common trade good Circuit Board is usually only found at Barnard’s Star. On the other hand, most trade goods and bond packages seem to be equally distributed to all stations. You can carry around what you find, up to a certain mass limit. If you carry around too much, you will get a warning that you are encumbered, and lower success rates for tests against the physical stats, and moving to a different area of the station reduces the physical stats. If you are at 100% encumbered, you will be losing 10% of each of the physical stats with every move to the different area of the station. If one of your physical stats reaches 0 because of encumbrance, you will lose consciousness and be taken to Sick Bay (or simply become unconscious), so try to offload heavy items at the first opportunity. If you don’t want to carry around stuff, you can sell it to the vendors, (go to Market → Vendors and then to your Inventory), to other players (go to Market → Public Market and then your Inventory), or store it (go to Market → Storage, buy storage if you haven’t yet, and then to your Inventory), or drop them right from the Inventory. On stations without a Market (for example the Jump Gates) you can still avoid encumbrance by going to Port → Shipping Bay, and sending the items to yourself on another station, where you can later pick them up and sell or send them to storage there. Common trade goods are mostly an annoyance, but some players hypothesize that they might serve as the raw material for crafting items, when that feature will be implemented in the future. You can sell rare trade goods for significant credits at the NPC vendors, or use them as a means to transfer money to other players without paying the 10% market fee. In the Wrecks sub-area of the Ruins you can also search for random encounters (Look for trouble). Each search costs 5% Agility and Stamina each, and 10% Focus. When you find somebody, you can engage in combat with them (but you don’t have to do so immediately; you can, for example, consume a ration or even retire to your hotel room first for some stats replenishment). Upon finding an opponent in the Ruins, you have 8 segments to fight them. When you win such a fight, you can loot the opponent, which tends to give you on the order of 1 to 100 credits, and you gain a reward. The reward on lower-level stations is often a piece of armor or a weapon, and on higher-level stations it can be a ration. For example Look for Trouble on Yards of Gadani and Bordeaux rewards Old Combat Suit and tier 2 rations, while on Hopkins’ Legacy and on Caen Stronghold, the reward is almost exclusively tier 3 rations. You also gain experience from victorious combat, more so than from career tasks. After finding an opponent, you cannot engage in another random encounter for the next 8 segments. You can halve this waiting time by spending 10 bonds. If you lose in combat, you are sent to the Sick Bay for recovery, or die on Bordeaux Station and Caen Stronghold (which don’t have a sick bay). Many new players seem to have a very hard time doing combat in the ruins, so I’d recommend to wait until you have reached level 6, which comes with access to much better weapons and armor. Starting from level 5, you can also Enter the Sewers. The sewers are accessible at København and Taungoo in the Sol system, and at Moissan, Cirque Centauri and Yards of Gadani in the Alpha Centauri system. At Barnard’s Star, only The Maid of Orléans has accessible sewers. This gives you a list of six opponents that you can attack in order, with the second becoming available once the first has been defeated, and so on. In contrast to Look for trouble, the reward is shown before you attack the opponent, and includes 5 bonds for the third and 10 bonds for the sixth opponent. The level of the sewers opponents are one to two levels above the player level, so for higher-level players, they can be much stronger than the look for trouble opponents. The final opponent also gives you two random rewards, one of which can be an item or a bond package, the other one is a (multi) stim of the player’s tier. The cool-down period for Enter the Sewers is 92 segments (about 22 hours), which you can also halve by spending 10 bonds. You can and should pursue a career. Performing career tasks is the most reliable source of credits, and once you have been promoted a few times, the largest reliable in-game source of bonds. When I picked my career, I read through the descriptions, and picked the one that sounded best. You should be more strategic in your choice. The first factor you should consider is the primary and secondary stat associated with the career tasks. You should favor a career that makes use of Intelligence, because in the context of University courses, it makes sense to boost that stat anyway. If you are planning on doing Player-vs-Player combat, you should favor a career that uses physical stats, because then the stat bonus contributes to your combat ability. The second factor is availability. Career tasks can be tied to locations (you can only repair ships at a Port, and only analyze security footage at Security), and not all stations have all areas. Ports and Brigs are everywhere, Sick Bay and Security are also nearly ubiquitous. Cloning Vats can be found on all stations except Daedalus, the Sol Jump Gate and Ghost of Mali. In contrast, only four stations have embassies. Finally, some careers are more dangerous than others; if a majority of tasks sound illegal, you might spend quite some time in the Brig. (Though illegal tasks tend to pay much better than comparable legal tasks). See the separate career page for a list of tasks per career. Note that you can abort your career at any time, and even later return to that career with no repercussions, except of course the time you missed advancing your career. You advance your career by succeeding at career tasks. You go to different areas of the station, and click on the “Tasks” tab, and then attempt some tasks. The career overview page lists all available tasks on your current station, and where you can try them. If the area a task depends on does not exist at the current station, the task will not be listed. Each success adds to your career experience, and each failure of the same task reduces your career by half of that amount. The experience is higher for tasks further down the list, even if the bonus is lower. Each night at midnight CET, or around GCT /95:900, the number of days you have spent in a career rank increases. At the same time, you receive your regular payments of bonds and credits, depending on your current career rank. Once your career experience is at least 100% and you have spent enough days in the current career rank, you are promoted. If you fail enough tasks, you can also be demoted again. The minimum number of career days per rank increases exponentially: you can get promoted after 2 days in career rank 1, after 4 days in rank 2, 8 days in rank 3 etc., all the way up to 128 days in rank 7. Career tasks use up 20% of the affected stat, and 5% focus. On success, you get a bonus in credits (between 3 and 320, depending on the difficulty of the task), which is the primary source of most player’s credit wealth. At the very beginning, you will only be able to perform the most basic tasks, with payouts of 3 to 5 credits, which are annotated as Easy or Normal. As your career experience increases, more difficult career tasks become achievable. In general, you should try career tasks where your success rate is higher than 50%. If your success rate is higher than 80% or 90%, you might try more difficult tasks (which are those further down the list), because they yield higher returns. The spread between the lowest and highest task bonuses is much larger (factor 100) than the career XP gain spread (factor 8-10). Hence if you primarily want to advance your career, you should stick to lower-level tasks for which you have a high success rate. If you want to optimize for making credits fast, doing the harder but better-paying tasks is the better strategy. How Can I Check My Career Progress? The career experience is shown on your character page in the Career section. What Determines Career Task Success Rates? Task difficulty. Easy tasks are listed first. Player level. Many players have reported more failing career tasks after leveling up. Some players have also reported that career task success rates have gone down after they have leveled up, even though their stat ranking has stayed the same. Either the stat ranking is more granular than the few steps that are exposed to the user, or there is another factor at work that incorporates the player level. Side jobs are brief, one-off jobs that pay a fixed reward. They consist of tests against the same stat until you have passed five of them. They pay less than career tasks, but give you much more experience. The available side jobs and their pay depend on the station. In most cases, the potential rewards depends on the station level. For example on Taungoo Station (level 5), the stats boost tends to be on the order of 0.02, while you get something closer to 0.04 on Yards of Gadani (level 10). The stat bonus also depends on the station. For instance, on Hopkins’ Legacy the stat bonus is always for Strength, while on Yards of Gadani it is for Social, Strength and Stamina. See the Taustation wiki for more details. Completing discreet work also improves your reputation with the affiliation of the government that controls the current station, which in turn leads to shorter Brig times when you get caught doing something illegal, and to some vendor discounts. Some of the anonymous missions involve stealing an item from somebody, and bringing it to somebody else. Between those two actions, the item is in your own inventory, and you can steal it by aborting the mission. The only repercussion is that after aborting an anonymous mission, you won’t be offered a new one for a while. For valuable items such as rare weapons, rations or bond packages, this is usually worth it. Despite the disclaimer of potential danger, Discreet Work has never brought me into the Sick Bay or the Brig. Discreet Work tasks consume 20% of a stat if it is “Average”, and 5% if it is “Exceptional”. Failed tasks do not consume any Focus, successful tasks consume 10%. Don’t try to be clever when doing Discreet Work; for example, what it says “you must find Aearis Tinsley”, you won’t find her by looking through all areas of the current station; you have to follow the mission steps. If you can’t seem to find your next step, the mission overview should help you find it. You can start discreet work while being on a mission. The link for discreet work isn’t shown while you are pursuing a mission, but if you follow this link to discreet work, you can start it anyway. Syndicates are Tau Station’s group play feature, currently under heavy development. Please see the the separate page on syndicates for more information. University courses can teach you handy skills. You have to pay some credits to enroll in one, and can optionally spend bonds to speed them up. The basic courses are relatively cheap (typically around 200 credits and fast, while more advanced courses take much longer (up to 28 days), and can cost up to several ten thousand credits. You can only be enrolled in one course at a time, and you cannot abort a course that you started. Travel, Sick Bay and Brig do not affect University courses, which just continue in those circumstances (though may delay the completion of a course until you are free to move again). In the beginning, you can likely only afford basic courses, so you should enroll in those. Having an above-average intelligence (as shown by the stats ranking on your character page) makes courses faster. With “Exceptional” intelligence, you can reduce time to completion by 15%. You can also spend 99 bonds to speed up the course by 50%, so the combination of both reduces the time to 35% of the original length. University courses are a long game. A typical module consist of courses that last 1, 7, 14 and 21 days, so more 6 weeks, and even with full acceleration it’s more than two weeks. Thus you should be enrolled in a course all of the time to get the most of out it. One module that can be generally recommended is the collection of Anatomy courses available on Nouveau Limoges, since it boosts stats recovery – something that is useful no matter what career you pursue. Most courses only have negligible benefits on their own, but if you finish several related courses, the compound effect is typically noticeable. The Anatomy module consists of Healthcare, which speeds up stats and focus recovery slightly, and Self-Surgery, which speeds up recovery in the Sick Bay. Intermediate Combat unlocks the combat belt, which allows you to carry stims during combat (which can quickly regenerate a stat). International Relations seems to make it easier to convince other people to do things (so corresponds to an increased Social skill). The Item Repair courses from the Engineering module allows you to repair weapons and armor on your own, instead of having to pay for it, and serve as prerequisites for the Ship Engineering module. The Spaceship Operations module contains Navigation, Technology and Handling To be able to purchase a ship, you’ll need (in that order): Navigation 1 and 2, Technology 1 and Handling 1. Additional Ship Engineering and Advanced Ship Engineering modules allow you to improve the fuel efficiency and damage resistance of your ships, as well as shorter Jump Gate travels. VIP packs provide many benefits, documented here. The most important ones are 150% Focus, much faster stats regeneration, and larger experience gains. Playing with an active VIP pack is significantly more fun and more efficient. When you first use one, all your stats go to 100%, so it makes sense to exhaust your stats through career tasks or so before you use one. You can buy VIP packs on the Public Market when other players are willing to part with them. You can also sell VIP packs on the Public Market, for up to 10,000 credits per day of VIP, and even more for 3-day VIP packs. VIP packs are all of tier 1, but work regardless of player tier. You can travel from station to station within a star system through local shuttles. If you want to travel to a station in another star system, you first need to travel to a jump gate, from there to the other star system’s jump gate, and from there to the station you want. Travel cost and duration depends on the distance between stations, which varies depending on the current orbital positions. Note that you can pay for public shuttles with credits; just scroll down! The regular shuttles are below the premium shuttles that you pay with bonds. While traveling, you can’t do anything except training intelligence. During the journey, stats and focus slowly regenerate. So before longer journeys, it makes sense to use up your current stats for career tasks or other purposes. While planning your travel, be aware that hotel rooms cost more at higher-level stations, and that shifting orbital positions can make the return travel more expensive. You need a Gaule visa for visiting stations under the Gaule government (basically any station with French sounding names). As a VIP, you can buy a Gaule visa at any station’s Gov’t center. Otherwise, you need to buy it a Gaule Embassy on Tau Station (Sol), or the Jump Gate in all other systems. In any case, you pay with credits, and more on higher-level stations. You can continue your career on any station that has areas where you can perform career tasks, without any additional bureaucracy. During travel, University courses also continue to progress. † Caen Stronghold does not have local shuttle access. Express shuttles or personal ships may be used to access the station. If you get stuck on any station except Tau and Caen Stronghold, you can go to the Government Center of that station, and take the emergency shuttle back to Tau Station. You can book this emergency shuttle even if you don’t have enough credits to pay for it, and you end up in debt for the missing amount. The price depends on the player level, not on the distance to Tau Station. See the wiki for a price list. The emergency shuttle leaves immediately after you chose to use it, and it is non-stop even from stellar systems other than Sol. The experience from combat depends on the opponent’s level; so for high-level players fighting high-level players and NPCs, for example through the Enter the Sewers feature, combat can become the primary source of experience. When you reach 100% experience of the current career level, you ascend to the next level. On leveling up, you receive a small bonus in credits, and immediately regenerate all stats and Focus. Levels are capped to 25. Leveling up also gives you access to more missions, which have minimal player levels as prerequisites. Stations have levels too. You can enter stations with a higher level than your own player level, and perform career tasks, train in the gym, train your intelligence in the hotel room, or social in the lounge, provided that the relevant stat is high enough. You won’t be able to start missions, do discreet work or side jobs though. All of these factors combined mean that, as long as you are not playing missions, it usually makes sense to spend your time on higher-level stations. Each block of five levels is called a tier, and ascending to a higher tier (so from level 5 to 6, or from 10 to 11 etc.) gives a bonus of 500 bonds. You cannot equip items of a tier higher than your player, so a tier 1 player cannot equip a tier 2 or tier 3 weapon or armor. Carrying, storing and selling items of higher tiers works fine. The daily rations you receive at the Government Center correspond to your own tier. Consuming rations of lower tiers gives you smaller immediate stats refills, and shorter “Well Fed” times. You can attack players and some NPCs, and other players can attack you. Combat is turn-based, though in Player-vs-player combat, only the attacker can choose actions; the defender acts automatically. In combat mode, there is also a countdown for when Security forces will likely arrive. When you try to attack somebody, there is a chance that Security detains you on the spot. The chance depends on the Orwellian level of the station (which you can find in the Government Center). Disabling the security cameras in an area significantly reduces the chance of getting caught. If you are caught, the length of the stay in the Brig depends on the law level. Tau Station is super paranoid, and you can’t ever attack somebody successfully there (with the exception of random encounters in the Ruins). You can wear an armor suit, and equip up to two weapons. There are three kinds of damage, Impact, Piercing and Energy. Weapons have an inherent accuracy, and one or sometimes two kinds of damage they make. Combat starts out in long range, and after four actions the distance changes to short range. Shotguns, rifles and sniper rifles are suited for long-range combat while blades, improvised weapons (clubs), hand guns and short-barrel rifles work in short range combat. Using a weapon in the wrong range incurs a penalty, and using a hand-to-hand weapon (blades and clubs) in long range is a guaranteed miss. After completing the Intermediate Combat University courses, you also have slots available on your belt, where you can equip stims that let you boost a stat that is running low. But be careful, they also raise your toxin levels, and when those reach 100%, it’s off to Sick Bay. In future, it is planned that you can also use grenades, and equip them on your combat belt. The success of an attack depends on the physical stats, the accuracy of the weapon, and combat skills (which can be acquired through University courses). A successful attack can wound the opponent, which reduces a physical stat. Higher physical stats thus provide a layer of defense. Once a physical stat drops to zero, the loser becomes unconscious. If the attacker wins, they can loot credits from the victim’s purse, but cannot steal items from the loser. Each combat action costs 3% Focus if your opponent successfully attacks you, and 1% otherwise. If you run out of Focus, you are detained to the Brig. On stations with a Sick Bay, the loser can then recover in the Sick Bay. On stations without a Sick Bay (currently only Bordeaux Station and Caen Stronghold), this can be the death of the character’s body, which triggers the activation of a clone. You can practice combat by going to the Ruins and using the “look for trouble” feature. You have two weapon slots that you can equip from your inventory. Since combat starts with long range, and goes to short range after four rounds, you should usually equip one long and one short range weapon each. If possible, you should also select the weapons to do different types of damages, which increases your chances against an opponent with specialized armor. (There are also weapons that are only available as mission rewards, and that can be quite effective; they have been omitted from the table above, as well as extremely heavy weapons such as sniper rifles). Please check the armory for more comprehensive weapons recommendations. Be aware that you can only equip weapons and armor of your own tier or lower, not of higher tiers. Successful combat from Look for Trouble and Enter the Sewers in the Ruins often rewards you with weapons or armor. Sometimes Discreet Work gives you a weapon as reward. Some missions give you a weapon as reward. Discreet Work often involves stealing or finding a weapon, and delivering it to somebody else. You can steal the weapon you are meant to deliver by aborting discreet work (which bans your from further discreet work for roughly two hours). You can buy them at the Public Market. You can buy them at vendors, where the offering differs from station to station. The item list on TauHead gives a convenient overview which weapon can be bought were. You can find items while scavenging in the Ruins. Weapons and armor can be damaged during fights. When the fight is over, you can either repair it yourself if you have completed at least the basic Item Repair University course, or pay for repair. You can repair your weapons everywhere, but the hotel room is the best choice, since nobody can attack you there. Otherwise, being attacked during repair interrupts the repair. To repair an item, go to your inventory, then unequip the weapon, and then click on “repair”. The repair takes time, and consumes a bit of Intelligence and Focus. You can’t do anything else while repairing. You can spend bonds to make the repair instantaneous. where skill\_factor is 13 for skill level 1, 11 for skill level 2 and 8 when you have completed all three Item Repair courses. If you want to pay for repair, you first have to go to Port → Shipping Bay, and then in the inventory, unequip, and then send it for repair. With this option, you can do other things in the mean time. You will be notified when the repair is finished. Then you can pick up the repaired item from the Shipping Bay. Items cannot be repaired once their damage is too large. With Item Repair 3, you can repair items that have 5% or more health left . To be on the safe side, you should repair your items when their health falls below 75%. A clone is an insurance against the death of a character’s body. You can buy a clone at the cloning facilities that are present on most stations. The mental model behind a clone is that it is an inactive duplicate of the character’s body, and receives all experience and knowledge as a constant feed from the active body. Once the active body dies, the newest clone is activated. So the character keeps its intelligence and social stats, as well as experience and career experience, but reverts back to the physical stats of the clone. Each player has a default clone on Tau Station, which is automatically updated when you level-up. Due to this mechanism, clones are typically only of interest when you reach the level cap at 25, or when you use them to change your Genotype. YZ Ceti YZ Ceti JG ? ? ? 3D-printed clones might experience mutations while created - meaning that their stats have a chance to get lower than the original ones. You can, however, purchase the Positive mutation perk for 20 bonds that will actually make your 3D-printed clone “better” than original you! 3D-printed clones always have the same genotype as original. However, if you purchase a vat-grown clone, you can select its genotype against an additional payment of 20 bonds. Both vat-grown and 3D-printed clones have a fixed gestation time of 100 segments (one day), which can be halved for 70 bonds. Premium clones cost a flat rate of 99 bonds, and offer the advantage that you can later update them to your current physical stats. You can spend 20 bonds per clone to update them all to your current physical stats. The gestation time of a premium clone is 200 segments and can be halved for additional 99 bonds. When you die, you lose all the cash in your wallet. The items you were carrying are available from the Government Center of the station you died on. Then the last-gestated clone is activated, if you have one, or the default clone on Tau Station otherwise. After activation, the new body is confined to the clone vats for some time, starting at 10 segments, but increases each time you die. After the new body is released, you have access to your bank account, storage and ships. There are currently four factions, Consortium, Gaule, Independent and Freebooter. Players have reputations with all of these factions, starting with either Mistrusted (Consortium and Gaule) or Avoided (Freebooter and Independent). Missions can improve your reputation with a faction that you helped through your actions. You can also improve your reputation with Gaule and the Consortium by completing the University courses from the International Relations module. Discreet work also improves the reputation with the faction that governs the station you are on (between 30 and 40 successful discreet works to get from Avoided to Mistrusted, and more for getting to the higher reputations). You can send items to other players, or to yourself on specific stations. To send an item to another player, you first have to add them at the contacts page. In either case, go the Port and then Shipping Bay, and then to your inventory. There you can select an item, and click on Send item. This lets you select the recipient, and if you select yourself, the destination station. The shipping price depends on the distance and the shipped object’s mass. After the object has arrived, the recipient gets a notification, and can pick up item at the Shipping Bay. If they don’t do so within 20 days, they get a notification that they have ten days remaining, otherwise the item will be sent back. You can send items to yourself if you do not wish to carry them around (for example if they are too heavy to carry them around the whole time, or you don’t want to risk losing them if your current clone dies). This is also useful to avoid encumbrance on stations without a storage facility. You can also send items as gifts to other players, or in trade when you trust them to hold up their end of the bargain. If an item has been delivered to you to the shipping bay of a station that you are currently not on, you can redirect the shipment to the current station (for which you have to pay). You can sell items for a fixed price if you go to Market and then Vendors (and then select the Inventory). Each item has a nominal price, and you get 30% of that price at NPC vendors (though reputation bonus applies). The same vendors also sell items, but often for much more than the nominal price (like, a factor of 9 or so above the nominal price). The Public Market allows you to sell items to other players. You can select an item for sale, and define a price. You have to pay 10% of the selling price up-front, which covers shipping fees as well. If a player buys it within three days, you will receive the asking price directly to your bank account. Otherwise, you can pick up the item after three days at the Shipping Bay. Placing more than one item on the market at the same time also costs an increasing amount of bonds. To sell an item, go to Market → Public, then to your inventory, and select the item you want to sell. There, you’ll have a button “Sell to Public”. Please see the separate ships page for more details. Play the missions for fun and profit! Occasionally read the chat and socialize with other players. As soon as you have reached level 3, strive to spend most of your time on higher-level stations; training your stats is more efficient there, and you find more valuable things in the ruins. When you are not actively playing, spend your time in a hotel room, which speeds up stats and focus regeneration, and keeps you safe from attacks. Missions, Discreet Work and training your stats require more Focus than career tasks and ruins scavenging; so if you are on VIP packs occasionally, do the first-mentioned kinds of things preferably while on VIP, and focus on your career and ruins searching while not a VIP. Bring most of your credits to the Bank. Otherwise another player can steal them from you after defeating you in combat (and there’s always a better fighter). The Sol Jump Gate has a mission (“The Sleepless Ship”) that takes you to Alpha Centauri, so only engage in that mission when you are ready to travel to Alpha Centauri (level 7, most stats at 12 or more; and at least 2500 credits, since an interstellar jump costs around 1800 credits, and then you might need to travel to another station before you can earn much money). Only bother with clones after you have put significant effort into training physical stats, and even then it only rarely makes sense. Once you are on Hopkins’ Legacy at Barnard’s Star, do the Wall Maintenance side job once, as it is a prerequisite for a mission. More features around player Syndicates, cooperations of players that conduct business together. Trading based on economic simulations. More star systems, starting with Sirius. Prerequisites and Perks for career levels. Modifications (mods), implanted electronic devices that modify attributes of the body. TauHead harvests encyclopedic data from the Tau Station universe. The Taustation Archives contain information about star systems, stations, ship types and much more. Tau Wiki collects all sorts of interesting information. This Collection of Greasemonkey/Tampermonkey scripts makes Tau station much easier to use. It includes navigation enhancements, stats trackers and other goodies. The IRC channel ##taustation on irc.freenode.org is a meeting point for players who find the built-in chat cumbersome. Typically active during game updates. There’s a Tau Station subreddit.